Users are required to manually import all users in the GAL to their personal contacts list in order for those contacts to be seen on their phone natively. I'm wondering if it's possible to script Outlook to do this in the background. Any ideas? Assuming that your your organization is using Active Directory, then yes, it is possible after a fashion. In wouldn't be "in the background" as in silently and automatically adding contacts as they're added to AD, but it could be a process that you schedule using Windows Task Scheduler. Awesome! Can you help me design a script to do this? I can. Does the script need to just add contacts or does it need to update and delete them also? What details do you want to pull for each contact? It will need to update them for sure. As for deleting, this could be helpful, but it should be optional, meaning, the script should be able to run without deleting. Perhaps it would be easiest to design the update portion first. As you mentioned, running this as a scheduled task would be great. Will you design this so that it can be run without Outlook being open? Without the user seeing anything? Yes, my solution will run without Outlook being open. "Open" in this context means that the user does not have to have Outlook open. The script will open Outlook in the background, but that will be transparent to the end-user. They won't see anything on the screen. As to updates and deletes, the simplest possible solution is to have the script tag the contacts it adds and delete them all at the beginning of each run. That saves having to write code to handle adds, updates, and deletes separately. By deleting the contacts each time the script will treat them all as adds. Note that I'm only talking about deleting the contacts that the script has imported from Active Directory. It wouldn't delete any contacts that the end-user had entered manually. The alternative is to write code to handle adds, updates, and deletes individually. More code means there's more chance of something going wrong and it means each run will take longer. I don't know how many entries you have in Active Directory, so I can't forecast how much longer it will take. Let me know how you'd like to proceed and we'll take it from there. I've already written the code, so once I know which approach you want to take I'll adjust it accordingly and then post it along with instructions. Great, I'm glad to hear it will run in the background. I understand what you are saying about how to design the script. I'm not comfortable, at this point, having it delete the contacts first, as users may add other information to these contacts that should not get deleted. That said, I'd like to have it update/overwrite the contact fields with any new information that exists within AD. Does this make sense? Another way to put it is this. Currently we use the following method to do this on an individual basis. We open up the GAL, select all contacts and then choose Add to Contacts. 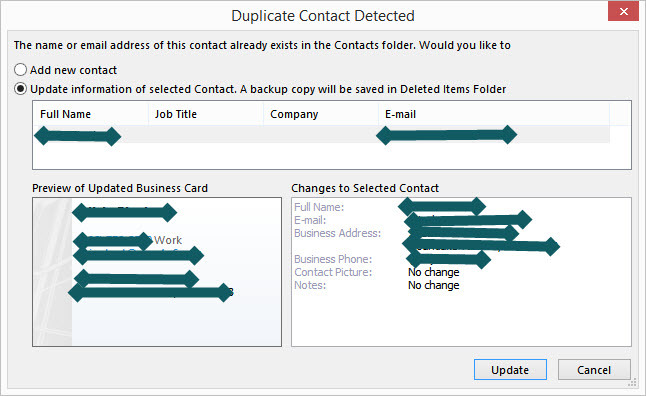 Outlook then updates the existing contacts with new information only. Please see the attached pictures. This is the process I'm trying to replicate. Hopefully this explains what I'm trying to do better. I realize we may not be able to do everything the same way outlook is doing it. If that's the case, please tell me and we can adjust according to what is possible. Here it is. The script reads all of the user entries in AD and copies the necessary information to an Excel spreadsheet. It then reads that spreadsheet and creates a contact for each person in it. On subsequent runs the script will update a contact if it exists, create it if it doesn't. The script keys on the NickName property of a contact, so don't edit that field in the resulting Outlook contact or you'll end up with duplicates. The contacts will all be created in your Contacts folder. I don't know what AD account fields you have filled in, so I used the most common fields. I can adjust that for you if I left something out or included something you don't want. I grouped the contacts together in a category I called "AutoUpdate". That way if something goes wrong, then you can find and delete all the contacts the script added by switching to category view and deleting all the members of that category. 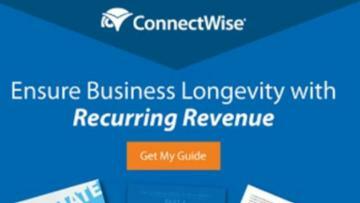 The script may take awhile to run, especially if you have a large number of accounts in AD. There's no visual notification of when it's done. I tested the script in my AD environment and it worked perfectly. Follow these instructions to use it. strSource = "'LDAP://" & strDNC & "'"
adoCmd.CommandText = "SELECT " & strFields & " FROM " & strSource & " Where objectClass='user' AND objectCategory='Person' ORDER BY samAccountName"
1. This is Awesome!! You're the man! 2. I noticed the script doesn't sync all user accounts. How does it determine which accounts to sync? I need to find a way to filter out certain accounts. 3. Would it be possible to have this script create a new contacts list list named "Company Contacts" and sync all the contacts to that list? 4. This script is awesome!! 2. The script syncs accounts that have an AD objectClass of "user" and an objectCategory of "'Person". That should copy all user accounts while leaving out such things as contacts. A contact in AD is an entry that lists an address for someone outside of the company. I further restricted the syncing to just those accounts that have both a first and last name, and an email address. That should filter out most service account entries. I can filter further if you want, I just need to know what you want to filter on. 3. I assume you mean a distribution list. Yes, that's possible so long as you don't have too many contacts coming from AD. There's a limit to the number of entries you can have in a distribution list. 4. Thanks again. Glad you like it. 2. I see. That's a good choice to filter by. I need to think if I need it filtered by anything else. 3. What I meant by this is not creating a distribution list, but creating a separate contact list. Please see the attached picture. 5. I realize this may change things significantly, but is it possible for this script to use the Outlook GAL instead of AD to pull this info? The problem is, we have some users who are remote and don't have a connection to AD. I assume the script would have to use the cache credentials for outlook in order to make a connection to the server. Is this possible? 2. Would it be possible to just filter by security group called "Company Contacts"? I would place all users and or contacts into a security group that I want synced. I haven't heard back from you in a while. Are you going to be able to make some of these additional changes? Apologies. I sometimes get distracted and forget about a question. The script isn't creating a distribution list. It's adding/updating contacts in your default contacts folder. If you want it to add/update contacts in a different contacts folder, then yes, that's possible. I realize this may change things significantly, but is it possible for this script to use the Outlook GAL instead of AD to pull this info? Outlook's GAL and AD are the same thing. What you really mean is can the script read Outlook's offline address book instead of AD. The offline address book is an extract of AD that's copied to the local computer. When you pull up the GAL in Outlook you are looking at the offline address book. The answer is that I don't know of a way to do that, but I'll check into it. Would it be possible to just filter by security group called "Company Contacts"? I would place all users and or contacts into a security group that I want synced. Yes, that's doable. It changes the way the script access the data though and may result in the script being much, much slower. Are you sure you want to go that route? Hey BlueDevil, Thanks for the follow up. Here are my responses to those three items. Can you do this? 1. Adding/updating the contacts into a different contacts folder will be ideal. 2. Pulling the information from the offline address book would be ideal, as it will allow this solution to work for users who operate out of home offices and don't have a connection to AD. 3. The last item of filtering by security group will be unnecessary, since we are going to use the offline address book. 1. Ok, I can modify the code to create the items in a different folder from the default contacts folder. 2. I'm still checking into a way to read the offline address book. No luck so far. 3. That's if we can use the offline address book. I'm not convinced that's possible. This is excellent, I was asked yesterday to look at the same thing. If I delete a user from AD, and assign a mobile number to a new user, will this do it automatically? Are there any possible issues with it deleting any local contacts which the user has added manually, IE people not in AD and personal contacts type situation? Is there any things which I need to be careful with running this script? CaseForensics didn't want the script to delete entries, so I didn't include that capability. I could add it though with just a few lines of code. Yes, the script would pick up a change to a user's mobile number the next time it ran. The script doesn't currently delete anything, so there's no chance of that happening. If a user manually created a contact and entered a nickname that matches that of a contact in AD, then the script could update the wrong contact. So long as the users leave the nickname field alone, then there shouldn't be any problems. You should of course test it in your environment to make sure it works and that it's doing what you want and expect. The script depends on AD being accessible to work and does not include any tests to verify connectivity to AD. If AD is not available (e.g. the network is down, the user's computer is not connected to your network), then the script will error out. Beyond that, I can't think of any issues that would be a problem. Is there a way that I could add a list of contacts not to sync? Example we have Meeting rooms which are users which it imports? Also we have helpdesk email users which I would like to remove such as ITHelpdesk, and Facilities Management etc? Something like a exception list I could add manually in to the script for user accounts not to sync. Last question, as I know I will be asked it by someone, the file as, can this be changed to First Name, Surname? Can you design the script to run this way? 1. Adding/updating the contacts into a different contacts folder. I thought I'd already answered those three questions. 1. Yes, I can modify the code to create the items in a different folder from the default contacts folder. 2. I've been exploring a way to read the offline address book (OAB) in place of AD. 3. I noted that this was contingent on being able to read the OAB. The good news is that I believe I have found a way to read the OAB instead of AD. I'll modify the original code and post an update as soon as I can (next 24 hours or so). sounds good. I wasn't aware that you were in ht middle of pursuing that. thanks! Good Morning, Sorry to be a pain. Any idea about my last questions? Again sorry to be pain.. Yes, we can add an exception list. The email address would probably be the best field to key on. Yes, I can set File As to whatever you want. That shouldn't really be necessary though since File As is filled in automatically by Outlook when creating a new contact. I need to finish the code for CaseForensics since this is his question. Are you interested in using the offline address book approach too, or do you prefer sticking with the AD based approach? Hiya, It looks like the AD system would be perfect, with the being able to add exceptions. Const MY_FOLDER = "Mailbox - Doe, John\Contacts\Mobile"
'--> Read entries from the GAL. If Outlook is in cached mode, then this will read from the OAB. Hello, Good Evening. I tested the script with 2 users today one with an android phone and one with an Iphone, and something strange happened. Android user was perfect everything worked as expected, However the iphone user now has email and txts messages showing the login for the user as the display name. I.e Shows Deley and not Darren Eley.. Example is attached of emails sent to my manager. I mistakenly left some code in that limits the sync to the first 25 items. Delete line 59 - 62 to get rid of that limit. I wonder if the iPhone is using the "Nickname" field in the Outlook contact. As a test, how about changing the Nickname of a contact and see if that changes the behavior on the iPhone? I will ask him to give it a go.. and get back to you. 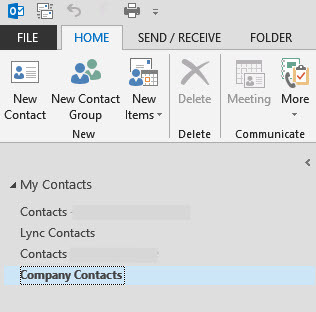 How do I locate the path to the contacts folder? It looks as if this path will be different for each user. Is there a variable that can be used for the path so that the only portion that has to be changed is name of the contacts folder? 'Const' is not recognized as an internal or external command, operable program or batch file. C:\WINDOWS\system32>Const MY_FOLDER = "Mailbox - Doe, John\Contacts\Mobile"
Each was unexpected at this time. I don't understand the C:\WINDOWS\system32 prompts. Did you go to a command prompt and type those commands in? If so, why? If not, how did you run the script? The path to "Inbox" is "Mailbox - Doe, John\Inbox". The path to "Reviews" is "Personal Folders\Marketing\Reviews". The path to "Project 1" is "Personal Folders\Projects\Project 1". nm, I made silly mistake and was running the script as a bat file instead of a vbs file. it works! However, I did find that the contacts folder exist before I can run the script. If not, I get the error seen in the attached picture. Is it possible to have this script create the contacts folder if it doesn't already exist? Also, the mailbox path I used was "username@domain.com\Contacts\Company Contacts"
This path worked, however, is it possible to use a variable for the username? Otherwise this script has to be hard coded for each user, which is obviously pretty ugly. I also noticed that it takes roughly 2 seconds to add each contact. 2x100 means this script takes roughly 200 seconds to run. Is this expected or is there something I can do to speed that up? Ok, I've made those changes. The script will create the folder if it doesn't exist, and since the folder will be under the default Contacts folder I've done away with the need for you to enter a path. As to the time it takes to run, if this is running from a scheduled task, then it really shouldn't matter that much if it takes 3 minutes. The user shouldn't see anything happening. It should be transparent to them. When I was testing to make sure that the script was in fact reading the OAB and not contacting the Exchange server, I set Outlook to work off-line. I noticed that when Outlook was off-line the script seemed to run faster. That makes me think that if Outlook is in contact with the Exchange server, then it goes to it for some of the information. Otherwise, it gets it all from the OAB. Try setting Outlook to work off-line and see if you get the same result. If you see noticeably better performance, then I believe I can set Outlook to work off-line, run the update, then put Outlook back on-line. I placed outlook in offline mode and the script doesn't work. It runs, and creates the necessary contacts folder and doesn't give any errors, but no contacts appear. Are you certain that Outlook is set to use cached mode and that you do in fact have an OAB? yes. I'm sure. The script doesn't work while connected to exchange either. Hi, wondering how things were getting on? I asked the user to check the Nickname setting and it was indeed the SAMACCOUNT when he changed it to the users Full name it updated all was working. Then I think we will be perfect, with the exclusion list. Then I'm stumped. It works in my environment both when connected to Exchange and when working off-line. I can't imagine why it doesn't do the same in your environment. Replacing samAccountName with the fullname won't work. The script is matching on that field and the match has to be a unique value to work. Fullname isn't guaranteed to be unique. samAccountName is. What I can do is use some other field to store the samAccountName and change the script to match against that field instead of matching against the nickname field. I can then set nickname to fullname without breaking anything. Hello, Good Afternoon.. Sounds like a plan to me :) Really what ever you think is best. I've posted my revised solution to your original question. I did that to avoid making things any more confusing than they already are for any future readers of this question. Thank you, I will take a look now. hmmm..... I'll try on another computer. I'm currently using Outlook 2013 on a Win 8.1 machine. What OS and Outlook version are you testing it on? Outlook 2013 on a Windows 7 computer. Sorry, that should be Outlook 2010 on a Windows 7 computer. I just tried on a Outlook 2010 Win 7 computer and it also did not work. I did get an outlook pop up as soon as I ran the script, saying that it was trying to connect to office365, which is the same message displayed when I attempt to access the online GAL for the first time after starting outlook. So it appears that it is not accessing the OAB. Also, no contacts folder was made and no contacts were imported. Are you able to help me further? If you set Outlook to work off-line, can you still access the GAL? If you can, can you view the properties of some entry in the GAL? When I put outlook in offline mode I can access the "Offline Global Address List" but not the "Global Address List". Your setup is different than mine when off-line. But, if I understand correctly, it's not working even when you're online. That's a mystery. The only solution I can think of is for me to add debugging code. The debugging code would create and write a log of what happens when the script runs. You'd run the script then send me the log. Does that sound like a plan? One additional question, how are you running the script now? Are you double-clicking the script to run it, or running it from the task scheduler? Please download and run this version. Once it's finished, you should find a file named Debug.log in your My Documents folder. Please upload that file back to this question so I can take a look at it and see if I can figure out what's going wrong. strDbg = objShl.SpecialFolders("MyDocuments") & "\Debug.log"
WriteToLogFile strDbg, "Connecting to Outlook"
WriteToLogFile strDbg, "Connected to Outlook"
WriteToLogFile strDbg, "Creating Company Contacts folder"
WriteToLogFile strDbg, "Company Contacts folder exists"
WriteToLogFile strDbg, "Disconnecting from Outlook"
Ok, I think I see the problem. Please download and try this version. Once it's run, please check to see if the contacts were created and please upload the log file again. That worked! Log file attached. I tried it in offline mode and it did not work. 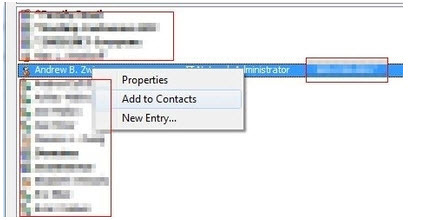 When in online mode - outlook boggs down significantly rendering it unusable for ~1.5min while the contacts update. We have 75 contacts. I'm guessing that if this worked in offline mode and pulled form the offline Address book the import would go faster and wouldn't bog down outlook. Once you've done that, set Outlook to work offline and run the script again. As to the how long it takes the script to run, that will improve some once I remove the debugging code. If we can get the script to read the offline address book, then it should improve more. Do you think you can get it to work using the Offline Address Book? Not enough information to confirm an answer. Is it common practice to delete questions? If so, why? I read that and the cleanup volunteer said it would be closed, not deleted. That said, I still don't see the reason to delete questions. Closing them without a solution should be adequate.